at Alida Cafe, 5:15 PM. January 15th, SAVE THE DATE. Joint SANE and MyUrbanSA event. Time and location TBD. We will discuss housing in light of the new CCHIP policy, dispelling myths and providing accurate information. Bike ride at 5:30 PM, led by Bike SA, begins at Rosellas Coffee on Jones (optional). Pizza, movie, mingle and drinks at the Impact Guild at 6:30 PM, 708 W Summit. Join us this Wednesday! Drink specials, urban dialogue, and a speaker. The City of San Antonio Zoning Commission will vote on proposed changes to the Infill Development Zones. Show up to testify on Tuesday! Many changes to the zoning are positive, but SANE has concerns about a couple of changes. For the mixed use zonign proposed - if the property abuts a single family neighborhood, a ten-foot building setback is required and the building shall not exceed two and a half (2.5) stories or thirty five (35) feet in height, if the structure is fifty (50) feet or less from the single family area. This will severely limit any devleopment along corridors such as Fredericksburg Rd, McCullough, Flores, and Blanco. Mixed use developments on corridors such as these will be near impossible. This will limit housing options in many neighborhoods, driving up the cost of current and future housing. IDZ-2 IDZ-3 the minimum parking requirements are reduced by 50%. Currently, parking is not required in any IDZ. Parking is expensive. What is traded for the expense of parking? Housing units! A parking space, depending on how parking is provided, costs $15K to $40K to provide. This increases the cost of housing units and limits the number of housing units from being built. In a city that needs affordable housing, this requirement doesn’t make sense. Furthermore, if San Antonio is serious about real transit for our near future then parking requirements seem extraneous. Did you know that last year San Antonio had the largest population increase (by numbers, not percentage) in the United States? If we don't come together now to decide how we want to grow, we may end up like so many other cities - pushed out because there isn't enough housing to meet demand, and prices go through the roof! Then local businesses are pushed out too, leaving a sterile city. Future SA Forum brings together experts with experience from many sides of the growth debate. You can submit questions both in person and online. Join us to discus what we can do now to ensure we maintain and grow our quality of life. Sponsored by SANE, MyUrbanSA, and Bike SA. An opportunity to provide feedback on teh task force's proposed housing policy solutions! Join SANE, Bike SA, and MyUrbanSA for an urbanist happy hour on March 29th at Dorcol Distilling Co! 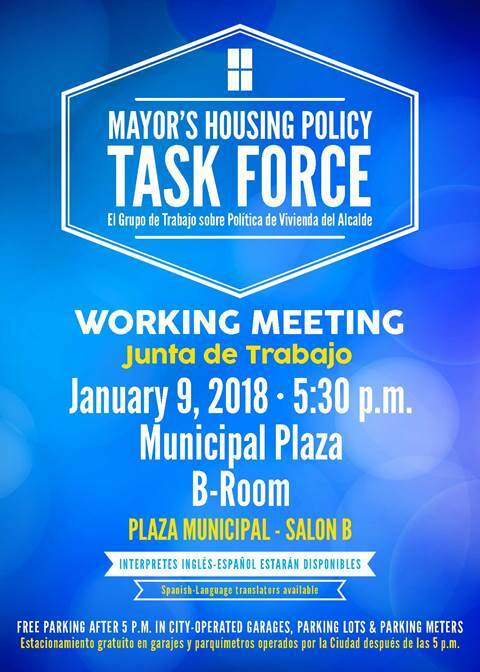 The Mayor’s Housing Policy Task Force next working meeting will be Tuesday, February 20th at the Municipal Plaza B-Room (114 W Commerce Street, San Antonio, Texas 78205) from 5:30 pm – 7:30 pm. General Meetings will be held in the 1st Floor Boardroom at the DSD Building located at 1901 S. Alamo, unless otherwise noted. Future Land Use Classification Meeting - rescheduled! The Planning Department will be hosting a citywide meeting to gain input on the proposed revised future land use classification. The updated classification will create consistency across the city’s land use plans and help implement the SA Tomorrow Comprehensive Plan. The meeting will be held on Tuesday, January 16th at the Henry B. Gonzalez Convention Center in the Cantilever Room at 6:00 pm. Free parking will be available as part of Downtown Tuesday. The SA Corridors Plan adopted by full council on Feb 8, 2018, 9 am, at 114 W. Commerce St. Please consider attending for public comment to support the plan and encourage Council to adopt. The SA Corridors Plan helps with VIA's application for federal funding for rapid transit in San Antonio. It needs your support to get it adopted by San Antonio Council (Council already pushed off adoption due to a vocal minority raising concerns). Call your District representative NOW to say you support SA Corridors - tell them not to delay any further! 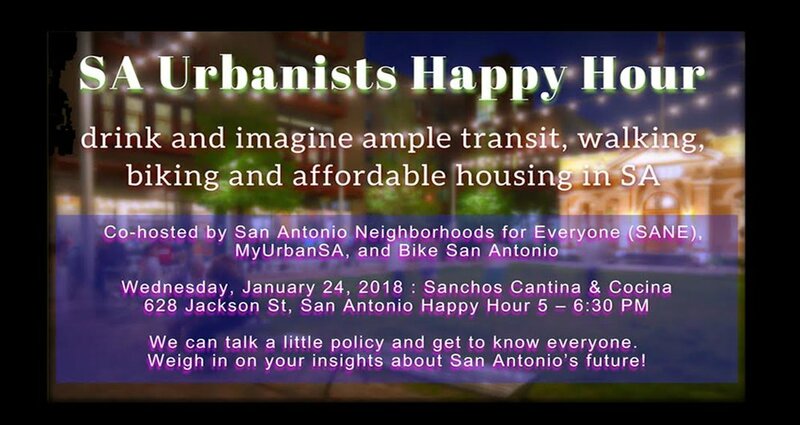 San Antonio Urbanists Happy Hour! Task Force Meetings will be held in Training Room B, 2nd floor at the DSD Building located at 1901 S. Alamo, unless otherwise noted. Community meeting to gather thoughts regarding the draft SA Corridors Strategic Framework Plan - a study concerning the growth of the San Antonio as it relates to future rapid transit options. If you want rapid transit to be a part of our city then it is important to attend the meeting and let your voice be heard! The Mayor's Housing Policy Task Force invites you to a public meeting to gather your thoughts regarding housing needs in our city as well as solutions you want to offer. Southside San Antonio first Surclovia event happens this Sunday. This turns city streets into a safe place for people to ride bikes, walk, exercise and play. Upcoming Mayor’s Housing Policy Task Force working meeting on Tuesday, November 14th. SANE will be holding a forum on SA Corridors with a discussion and presentation led by Jacob Floyd, senior planner at City of San Antonio. Come support, learn about, and advocate for SA Corridors! BRING FRIENDS that support rapid transit and a vibrant city! SACorridors.com is a vital plan that helps VIA receive federal funds for rapid transit. There has been some nimby push back on the plan recently, which has caused an indefinite delay in its adoption. SANE's advocacy can help change the outcome of the plan and get it adopted! Meeting will be held at The Impact Guild, 708 W Summit Ave. Drinks provided, bring a dish for a potluck! Task Force Meetings: 2:00 - 4:00 p.m.